Published 2018-07-29 in sections English, Reisen. I am currently on a road trip going from Philly going North along the Atlantic Coast into Canada, and aiming for Nova Scotia. When I passed from the US into Canada, I made had an unexpected emotional response to the highways there: I felt more at home! And I believe it has to do with the pavement markings on US vs. Canadian freeways. This is a typical exit ramp from the freeway. On ramps and cloverleaf ramps look similar. Note that the right-most lane goes somewhere else than the left and the middle lane, yet the lanes look completely identical. In particular, the lines between the lanes are shaped the same! Here, there are different lines between the different lanes: normal lane lines left, but a so-called continuity line, with a distinctly different pattern, between the normal lanes and the exit lane. It’s like in Germany! With this is mind I understand one reason1 why driving in the US2 noticeably more stressful: There is just always anxiety whether you are accidentally in an exit lane! 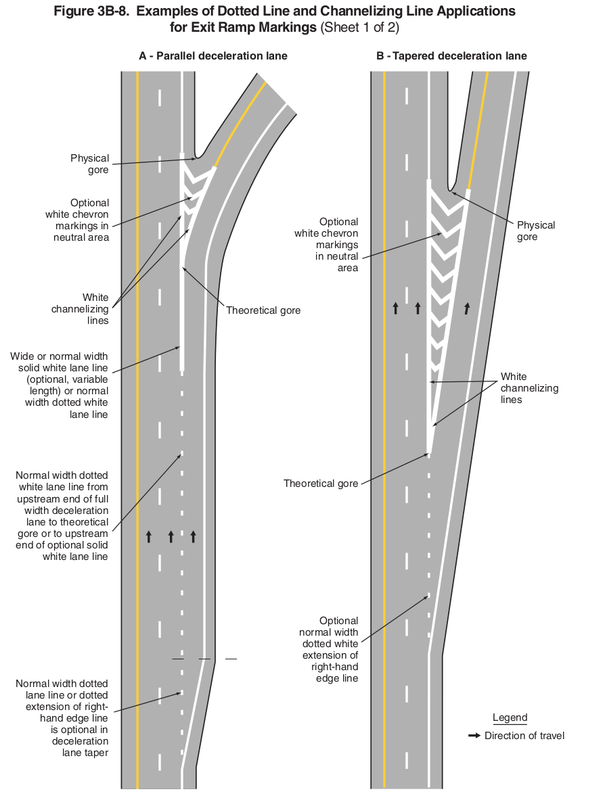 [..] the FHWA adopts language to clarify that dotted lane lines, rather than broken lane lines, are to be used for non-continuing lanes, including acceleration lanes, deceleration lanes, and auxiliary lanes. [..] a number of States and other jurisdictions currently follow this practice, which is also the standard practice in Europe and most other developed countries. The FHWA believes that the existing use of a normal broken lane line for these non- continuing lanes does not adequately inform road users of the lack of lane continuity ahead and that the standardized use of dotted lane lines for non-continuing lanes as adopted in this final rule will better serve this important purpose in enhancing safety and uniformity. So all is well! But it means that either Pennsylvania was slower than allowed in implementing these changes (the deadline was December 2016), or it was something else alltogether that made me feel more at home on the Canadian freeway. The US has had continuity lines for about 20 years now. They first started appearing on Oregon and Washington freeways in about 1998, originally to warn drivers that bicycles were using the shoulder to continue on the motorway and you could expect cyclist crossing from the shoulder to the gore anywhere between there and the bullnose. These lines were absent in the pacific northwestern US in places bicycles were not allowed on the freeway. This was originally (at least for North America) a northwestern US/western Canadian idiom for warning motorway drivers that bicycles would be crossing or entering the lane to continue on the shoulder. Now I live in Oklahoma, and even though bicycles are not allowed on the freeway, I do see continuity lines at the start of turn lanes and across exits on freeways here. 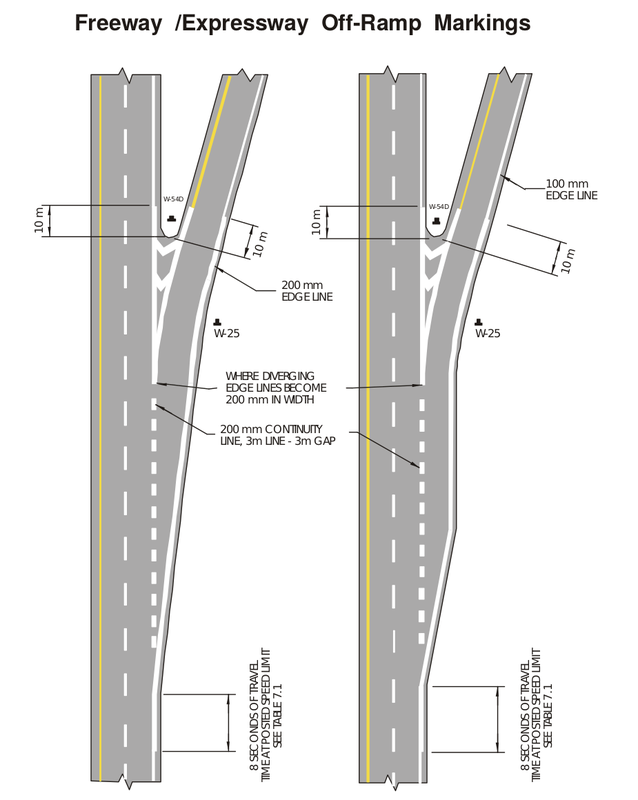 This has been the federal standard since 2009. https://mutcd.fhwa.dot.gov/htm/2009/part3/part3b.htm As someone from Oregon, I do not appreciate the change to such a basic marking at all. Oklahoma is, depending on the last recent overall renovation of the particular stretch of highway, somewhere beween the 1970 and 2011 revisions of the US Manual on Uniform Traffic Control Devices. Plus we don't retest drivers when the rules change. So we have purple signs for electronic tolls, which not everyone understands, and we have continuity lines, which nobody understands, except if they came from the pacific northwest and aren't road geeks or cyclists here, in which case their understanding is that it either means nothing, or that bicycles are allowed and to be expected across to the gore. Sure, I’ll elaborate in a new blog post. Here in Colorado, we seem to mostly have continuity lines on the actual freeways. Other roads are a different story. The major road near my Dad's place sometimes has 3 lanes in each direction and sometimes has 2. The third lane that goes away is the rightmost lane, and it usually ends by becoming a right-turn-only lane. There is no markings on it until right before it is about to force you to turn right. Once I figured this out, I realized just to never drive in this rightmost lane, when it did appear. It does seem that there is a lot of traffic variety here between different juristictions. Some places are using modern left turn controls (that have a road sensor, and leave a left green arrow on to allow all of the cars through, at least with a fairly long timeout). Other places still have left turn indicators that just stay on for a short time (typically 5-10 seconds) and only allow a few cars through. During busy traffic, the left turn lane can back up far enough to affect the flow on the rest of the road.